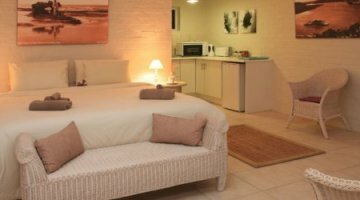 Five stylish bedrooms include quality king-size or twin beds, full bathrooms (free standing shower, bath etc), kitchenette (fully equipped with stove / oven, microwave, fridge, kettle, cutlery, crockery etc.) and balcony / verandah with lovely views onto the river. Every unit has a Weber braai at its disposal. Please note: The satellite TV (including M-Net) is a shared one. The balcony and private verandahs invite guests to relax and enjoy the spectacular views and the tranquil surroundings. The sun sets behind the river and the hills which can be experienced from anywhere on the property. Why not have a swim in the river, or catch some fish or enjoy the scenery on one of our canoes? 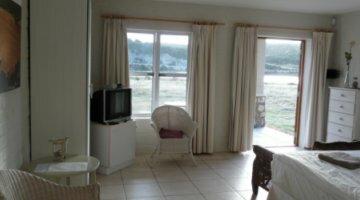 A swimming pool with a spacious outside area invites you to relax as well as the guest lounge with an open fire place and a flat screen-TV with access to all DSTV-programs. The area lends itself to spending lazy afternoons swimming in the pool and enjoyng a few books or magazines from the library. WiFi is available. The Anchorage is operated by a friendly German-South African couple - Annette and Craig Thorne - who have been in the hospitality industry for many years. The Anchorage is a perfect place to unwind and relax. Braai (barbecue) areas (ie Weber braai's) and canoes available. 9-hole golf course, scenic walks and river and sea fishing. During the high demand period over December/January and Easter DEPOSITS are NOT REFUNDABLE. In the event of premature departure we will charge the full extent of the stay that has been booked. Booked rooms can be let again if deposits are not received timeously. Rates are subject to change without notice if required deposits have not been received timeously. Kitchenette, Safe, Shared DSTV/Satellite, TV, Bathroom Facilities, Off - Street Parking, Beach House D�cor Style, Stylish, Restaurant on the Property. Revised: 25 Jan 2010 13:46:53 +0200.